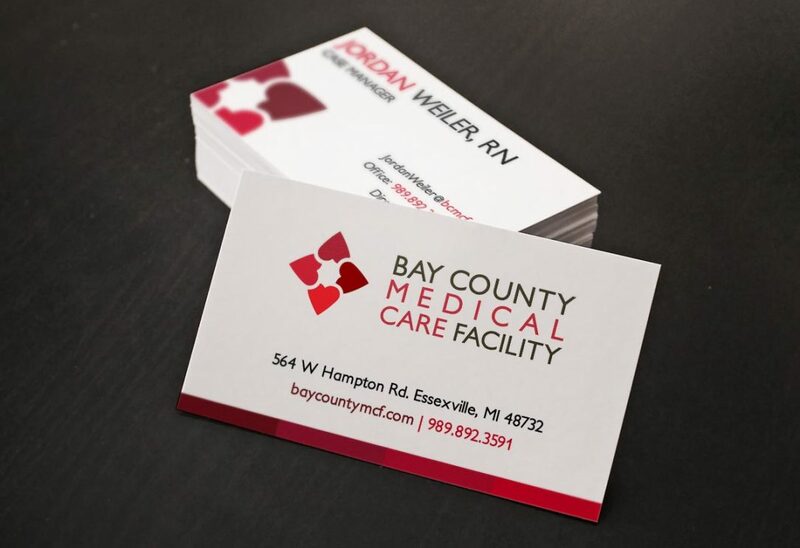 Bay County Medical Care Facility wanted new business cards to go with their newly-remodeled building. We were happy to help. After all, many experts call business cards one of the most effective direct marketing tools today. The Bay County Medical Care Facility gave us a unique challenge. They wanted to incorporate the heart from their previous logo into the new one. They also wanted something a little more modern and clean. The new logo meets all those requirements. Professionally-designed business cards create a positive first impression of your company. Do your business cards meet these principles? Simple is always better. Pay particular attention to your typeface. It must be easy to read. Include the essentials – your name, title, company name, address, phone numbers, email, and website address. Stick to one or two colors for maximum impact. If your cards are out of date or difficult to read, give Ohno Design a call today. We can design cards that build your brand.